We had to run to California and snapped this photo about 13 miles West of Quartzsite AZ. 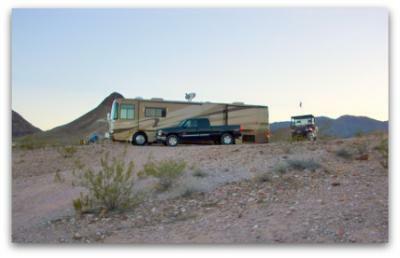 There were hundreds of RVer's parked out in the desert. Lots of them had four wheelers, campfires, and big social groups gathered around. It really looked like everyone was having a great time. We were surprised at the wide variety of RVs from the tiniest little egg camper to huge bus conversions. 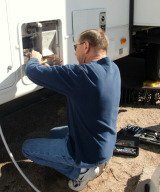 Many of the RVers also were using solar products, and generators for power.